We are a leading Manufacturer & Exporter of Sorting Color Machines such as Sorting Machine, Gum Sorting Machine (Chroma) and Gum Sorting Machine (Camsort) from India. 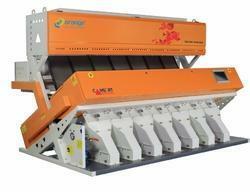 Throughput * Capacity means " Throughput"
Color Sorting machine that gives excellent output in less number of channels. CAMSORT DIGITAL is superior in its ensures optimum quality in sorting specific commodities. CAMSORT DIGITAL is available in 64 channels to 448 Channels with output capacity of up to 8 tons per hour* if 2% to 5 % contamination is present in the input commodity. The commodities that can be sorted using CAMSORT DIGITAL are all types of Rice, Rose Rice, Bauger, Sesame, Cluster Bean (Guargum), Sugar, Coriander, Gum, Dehydrated Onion, Urad dhal, Moong dhal, Broken cashew, Watermelon seeds, Cucumber seeds, Paddy seeds, Wheat etc. 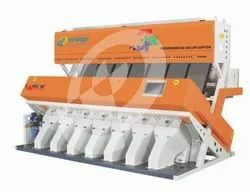 Backed by the sound experience of varied pros and cons of the market, we have been able to bring forth a range of Sesame Seeds Color Sorter Machine. As the name suggests, these machines are extensively used in the cereal grain color sorting applications in the food industry. Available in variegated sizes, models and specification, all our machines are acknowledged for their low maintenance cost, hassle-free operations and longer functional life. 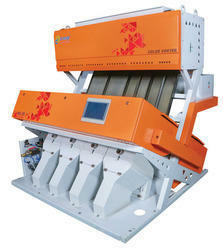 We are renowned manufacturers of high quality Sesame Spice Sorting Machine. These are highly functional machine that is procured from certified and reliable vendors. The camera sorter is manufactured with the latest technologies using high grade raw material. 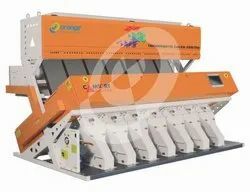 Being a quality centric organization, we are able to offer high quality sesame seeds color sorter. These products are checked on various parameters to ensure the efficacy of our products. The products are known for following features like minimum maintenance, long service life and simple installations. Our team of expert professionals checks these products at various parameters. Powerful Software that Makes Billions of Right Decisions to Identify the Size Of Defect & Spot Defect to Arrive Upon the Acceptable Product That Pass Through The High Tech Line Scan Camera in a Millisecond. Started with Rice today we have Machines for Various Commodities like Pulses Sorting Machine, Peanuts Sorting Machine, Cashew Sorting Machine, Tea Sorting Machine, Sesame Sorting Machine, Pepper Sorting Machine, Plastic Flakes Sorting Machine etc.. Our Machines are Already Running for All These Commodities Very Successfully.